I hope everyone had a good time at the 24th Annual National Convention in Pittsburgh, PA. I think it was a very good convention. As usual, the delegates came prepared to demonstrate why they felt their resolutions had merit, and articulated their arguments appropriately. Our conventions and the process of passing resolutions is a true illustration of how the democratic process should work. As is probably true for most of the delegates to the National Convention, you hit the ground running when returning home. The same can be said for your national officers. The convention took place smack dab in the middle of contract negotiations. With the contract expiring on Sept. 20, 2018, we went into a lock-down period with the Postal Service from Sept. 14-20, where the parties met around-the-clock in attempts to come to an agreement. In the end, we did come closer together on many issues, but were unable to complete the agreement. Because the parties were making headway and still talking, they agreed to extend the negotiation period by 30 days. I am writing this as an attempt to inform APWU officers and employees at all levels across the country of problems that continue to exist. These problems can cost employees thousands of dollars. I am talking about the untimely processing of PS Form 50s. The year 2017 was busy with contract negotiations for the Support Services Division. We negotiated and ratiﬁed three separate Collective Bargaining Agreements (CBAs). Our postal unit, Information Technology/Accounting Services, and two private sector units – Salmon Companies and a Mail Transport Equipment Service Center in Urbandale, IA – were all completed within the year. The Support Services Division ratified two of its tentative agreements in August. First, the Information Technology & Accounting Services (IT/AS) agreement, which had a 77 percent approval, and then the private-sector mail-haulers contract with Salmon Companies, with a 75 percent approval. 09/12/2017 - Following an overwhelming 429-129 ratification vote on Aug. 23, the new Information Technology and Accounting Services Centers (IT/AS) Collective Bargaining Agreement (CBA) with the United States Postal Service was signed by APWU President Mark Dimondstein and USPS Vice President of Labor Relations Douglas Tulino. 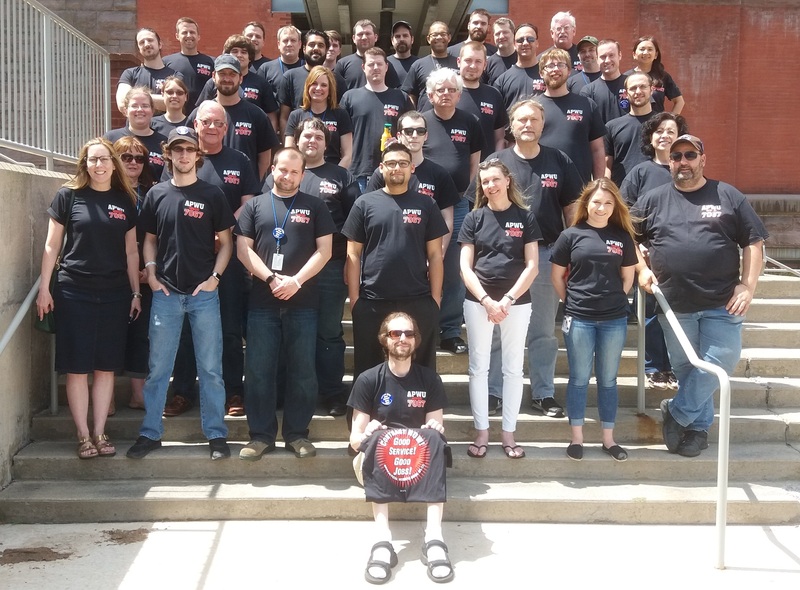 05/22/2017 - IT/AS Support Services members are wearing union gear on Thursdays to show solidarity during their current contract negotiations. Pictured are members of the Wilkes-Barre Solution Center. I would like to start off by thanking members for their patience and dedication over the past months. I know everyone is anxious to get a new collective bargaining agreement. The process has had its ups and downs but we continue to make progress. It is heartening and helpful to see members at our centers/facilities taking an active role by spreading the word, wearing buttons and t-shirts and demonstrating to local management our determination to get a fair contract. This is the solidarity that will get us a decent contract for all. Negotiations with Pacific Architects and Engineering, Inc. (PAE) for our Mail Transport Equipment Service Center (MTESC) were successfully completed with the membership’s unanimous ratification of the tentative agreement. The parties agreed to terms including a grievance process with just cause provisions. We were also able to achieve a “no lay-off” clause as well as a guaranteed floor in regards to a minimum number of full-time positions. We are hitting the new year running. We ended 2016 in the middle of contract negotiations for our Information Technology/Accounting Services unit, and are working under an extension to our 2011 agreement. The extension expires on Feb. 24, as this issue goes to print. We hope another extension is not necessary.